Is it to complement or extend an existing range of yarns? Possibly adding new colours or yarn specifications? Will this work in practice? After starting with just the individual breed yarns, we began to try out ranges and blends. Our first ranges were a 50/50 Shetland/Alpaca and our various organic yarns, based on Falkland Islands Corriedale with coloured wool or alpaca. All of these were designed carefully to be soft and attractive yarns and they did indeed sell quite well. However the Shetland/Alpaca seemed neither to satisfy the Shetland purists nor the alpaca purists! Perhaps it was the name! Also it’s still quite difficult, unless a farm-sourced name is added, to get the deserved premium on organic yarns. Similarly, alpaca opens an enormously wide variety of options. As our Natural Fibre Company organic and alpaca bespoke customers are producing great yarns, it seems to us unnecessary to duplicate. So a selection of organic and alpaca yarns, as well as some additional rare breeds and blends, is now available via our Natural Yarn Company marketing department within the Blacker Yarns website. This variety of carefully selected yarns from named farms and flocks helps broaden and deepen the availability of British breeds yarns. It is always a question of making choices… not easy when you run a wool mill! But we do have to be realistic: even when we have selected an appropriate yarn style and specification, carrying small stocks of too wide a variety of yarns can start to confuse us, and so we know it will confuse our customers and stockists too! Creating or extending a range for the sake of it simply doesn’t make good business sense, so behind all the decisions on fibre, yarn specification, blends, colours, etc., have to come the realities of money and stock levels, as well as the marketing opportunities afforded by each choice we make. Meanwhile, the lessons we learned with our earlier ranges led us to introduce both Blacker Classic and our new Blacker Elegance range, using naturally coloured alpaca to add a smoother finish and reduce bulk in the soft and fine Falkland Island wool. The Elegance range also fits neatly between our Blacker Classic and Blacker Swan ranges in terms of price and degree of luxury. Going back down the time-line, our first non breed-specific yarn range was Blacker Classic, designed to make pure wool yarns more accessible while not compromising on quality. We achieved this initially by adding 30% Blue-faced Leicester to Lleyn, but have since refined the Lleyn to a blend including Portland and other suitable wools. The second edition is even better than the first… and we are very pleased with it. As a woollen spun yarn, it improves with handling, age, washing and wearing and is a suitable alternative to most of our more expensive individual breeds woollen spun yarns. Because it is based on white, fawn and grey blends, it is not available in the darker browns and blacks, but these can be compatibly selected from our Manx Loaghtan, Black Welsh Mountain or Hebridean ranges, and indeed we add Manx and Black Welsh Mountain to make the grey and fawn Classic shades. Blacker Classic is available in 4-ply, DK, Aran and Chunky with natural and dyed colours in all but Chunky, which has the natural colours only, so it is pretty universal and we are gradually adding colours: new this year by popular request are pale blue, red and plum. However, Classic will not be available in lace-weight, both because our equipment permits this only as a worsted spun version at present and because the blend is not well suited to lace. The St. Kilda lace-weight is probably the nearest in character to Classic, while the Blue-faced Leicester and our planned finer Shetland weights will provide a good range of styles overall. Is it a new blend or for a new seasonal purpose or a new set of pattern designs? For instance are we blending wool with alpaca or mohair? Are we adding silk or flax? Do we want higher stitch definition for some design or craft technique? We have specialised, since our earliest days, in blending wool, originally with mohair, but also, as noted for Blacker Elegance, with alpaca. The first blend was of 50/50 Jacob with mohair, originated in Wales by Myra Mortlock, and we have extended this to blends of mohair with Manx Loaghtan and Hebridean (also previously Zwartbles too). The main purpose of the mohair blend is to add softness to a coarser wool, but it also of course adds lustre and whiteness, so this has enabled us to make some lovely subtle dyed shades over the dark grey Hebridean blend, the soft warm Manx blend and the mid grey Jacob blend. Because we now have dyed Teeswater, we do not need to continue with the colour sorted white Jacob/mohair and, for the same reason, because we have Hebridean/mohair, we equally don’t need the colour sorted dark Jacob/mohair (and it saves time and cost on colour sorting all the Jacob too!). However, we are looking at introducing some additional natural worsted spun pure Jacob colours in a silver and mid grey, to provide two more shades to our existing three. Adding alpaca has a slightly different purpose than mohair. While the smooth, fine fibre will soften a yarn, and also, like mohair, add to the drape and weight of a final fabric, the additional interest is from the many natural colours available in alpaca fibre. For our alpaca blends, now focussed on the Elegance range, we intend to add some further natural blended shades but will keep the whole range in natural colours – after all, we have plenty of dyed shades in Classic, Blue-faced Leicester, Teeswater and our mohair blends as well as in Blacker Swan! Elegance is woollen spun, helping to reduce any risk of shedding from the alpaca while still benefiting from the smoother finish achieved by adding alpaca to the blend. Silk is another interesting fibre for blending and we used to use tussah silk to help hold together our Castlemilk Moorit yarns, but we have now found fleeces of a quality which will work alone so can make a pure yarn from this particularly rare breed, which we believe is preferable. The right proportion of silk, or indeed any blended fibre, is crucial and silk in particular can easily overwhelm the wool, alpaca or silk, so we tend to keep it below 25% (silk is also expensive!). Generally, we find that less than 30% of an added fibre will add a desired benefit while 50% will make a completely different blend, but 10% can be sufficient in some cases – it all depends on the starting point! However, while we do add nylon and bamboo for bespoke yarns for particular purposes, we do not currently have plans for more Blacker Yarns using these fibres, both because we are trying to be sensible with containing our range and also because we feel that the energy consumption and environmental impact of these fibres is not entirely in keeping with our approach. 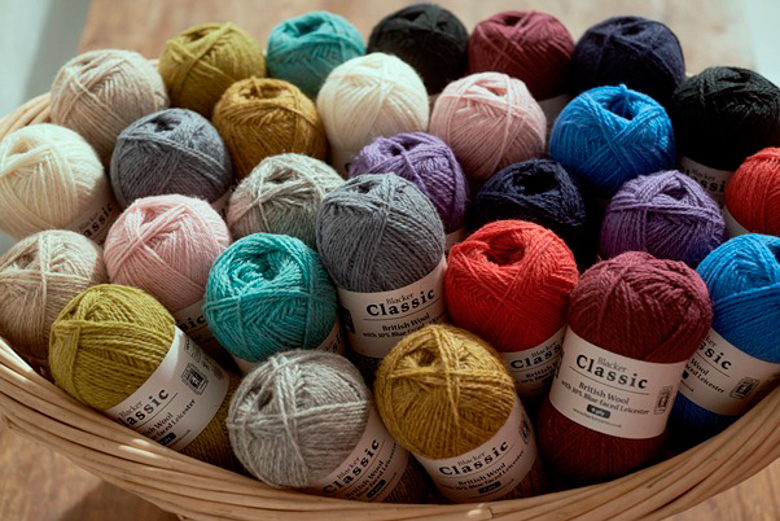 If it is a new yarn, how will it fit within our yarn ranges? Our most successful new yarn so far has been Blacker Swan, which is a very special luxury yarn, from a single farm and the result of a joint venture with Andrez and Alison Short in the Falkland Islands. When Andrez approached us, we were already seeking a high end, fine soft yarn and the trial batch more than fulfilled our expectations. The sheep husbandry in the Falkland Islands is of high standards and with Andrez’ small specialised ram breeding flock, even higher standards prevail. This is very important to us and fully in keeping with the Blacker Yarns and Natural Fibre Company ethos. And of course, the yarn is wonderful. We have, however, broken the rules a little, as Falklands producers, users and merchants would be horrified at the idea of adding coloured fibre to this white wool. Yet, if you make a pure white yarn and dye it, it lacks the variation and natural shading which makes for a special knitting yarn and also tends to have a slightly “artificial fibre” appearance when dyed. So we, very carefully, blend in small amounts of very fine fibre from carefully selected black Blue-faced Leicester or moorit Shetland fleeces, to make the Pale Maiden ivory base for most of the over-dyed Blacker Swan shades, and also the Sand and Stone shades. This rule-breaking is still within both our ethos and our overall approach to getting great natural-feeling and unique yarns, and these are the criteria which work for us. We also had to decide between woollen and worsted spun for Blacker Swan: the luxury objective led us to worsted as the choice, as well as the fact that the Dohne merino is a naturally bulky fibre so the yarn would come out a bit leaner and with better stitch definition if worsted spun, despite the slightly added risk of pilling from short, fine fibre. However, it would also be quite heavy in a thicker specification, so we have made our limited edition natural Chunky Pale Maiden yarn as a woollen spun. Meanwhile, we have also offered, for a while, a limited range of Guernsey yarns. These will never be the softest yarns but have a particular purpose in making dense, crisp, high definition fabrics, able to resist hard wear, wind and weather. 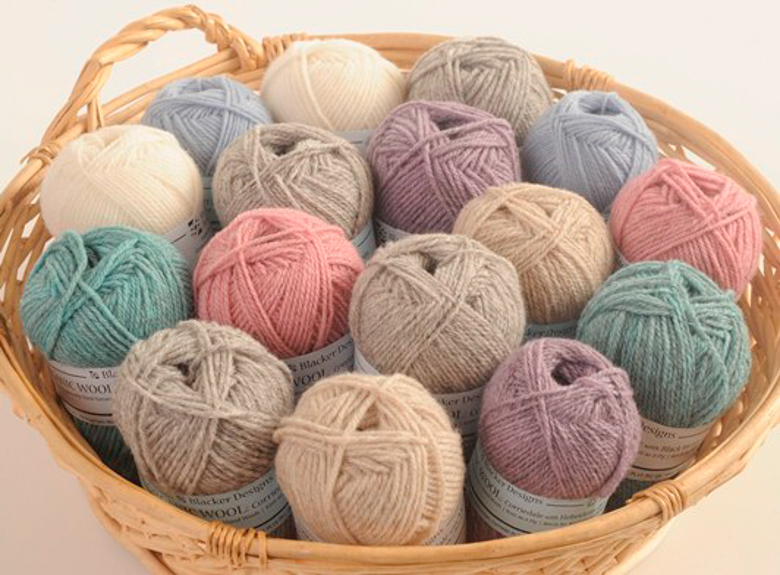 They are also a wholly traditional British yarn and we are carefully extending the over-dyed colour range and maintaining a basic set of natural shades in pure or blended named breeds. These yarns are also particularly suitable for the slightly coarser and stronger wools, and enable these to be used as knitting yarns rather than being relegated entirely to weaving or rugs. We will also continuously review the opportunities for rare and special breed yarns, seeking quality and appropriate supply, but this is now working so well for The Natural Yarn Company that we can be quite choosy … although there are tempting British flocks of white and coloured merino and Vallois Blackface around, worth a try probably? 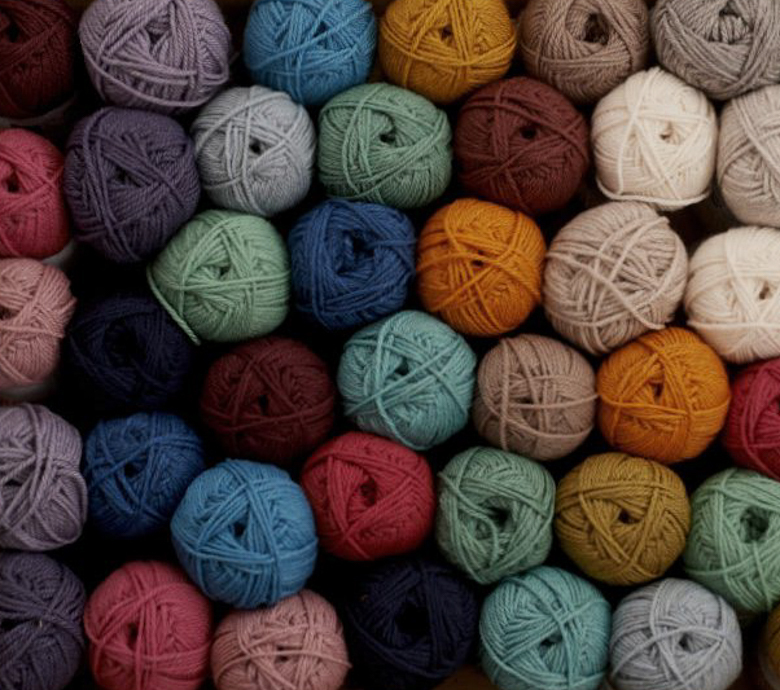 Thanks so much for these interesting posts on yarn design from a mill’s perspective! All content © Sue Blacker and used with kind permission.